Look away if you’re not remotely interested in weddings. There’s really nothing for you in this post! I’m reliably informed that it’s 109 days until we get married. To quote Eleanor from The Good Place, “Holy forking shirtballs!”; it’s not that long at all now is it?! After our initial wedding planning blitz, we sort of left everything alone for a while. It felt too early to be doing some things. Over Christmas I started to feel a little bit antsy about the amount that we still needed to get done. Not that I didn’t enjoy Christmas, but it was almost a feeling of wanting everything back to normal so I could get on with stuff. 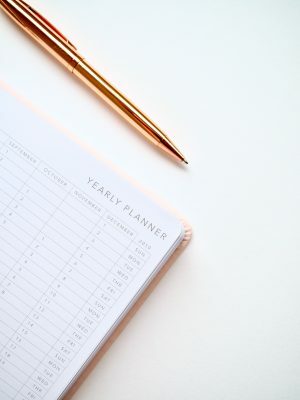 I kept thinking about bridesmaid dresses, invitations, hair, my dress, make up, hotels, seating plans, my dress, decorations, readings, rings, my dress… the list felt endless. I don’t think I slept much over Christmas at all! Obviously the biggest thing on my mind recently has been my dress. I thought I was all sorted with what I wanted to do when I made my muslin, but I’ve changed my mind again. It’s got to be a pro for buying a dress; once you’ve bought it, you’re sticking with it! I won’t give too much away this time, but I spent a long time poring over vintage style patterns and I’ve chosen one. I need to get it ordered so I can start my muslin process all over again! To get the ball rolling with dress making, I decided to head into Birmingham to go and buy some lace for this part. I took Andy with me, which will probably illicit gasps of horror from you traditionalists, but I wanted his opinion. He’s not 100% sure what I’m doing with the lace anyway, so it’s fine. 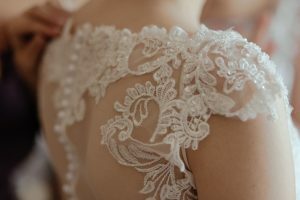 Lace – Too Much Choice! I had no idea there there were so many different types of lace available. 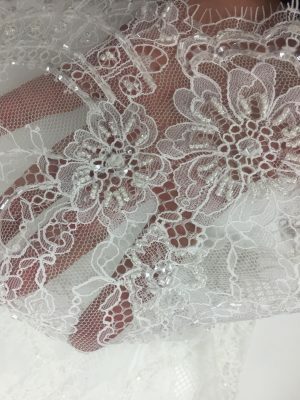 As almost all of my sewing is with cotton, I’ve never really looked at lace in detail before. 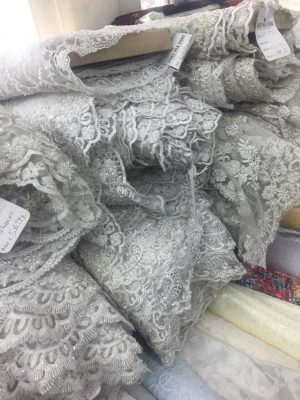 I definitely preferred looking at all of the lace in the shop, rather than choosing something online. As with all fabrics, the quality differs vastly and I also think you can only really see the colour and how it moves if you look at it in person. A lot of the lace had embellishments on too, which changed how they draped and how they caught the light. The choice was a little overwhelming and I only went into one shop. I honestly thought that we’d go in, look at a few and it would be pretty easy to choose. Nope. It took me an hour. It would have taken longer, but I’d only paid for an hour parking! I was drawn to about five or six and spent an hour just getting the bolts back out, stroking them, seeing how they draped, looking at the prices and starting the whole process again. I’m not sure the staff were impressed. During this whole wedding planning process, I’ve been very conscious of our budget. It’s not tiny, but there is a budget and it’s not extravagant. Sewing my own dress is obviously only a fraction of the price of buying one (although that isn’t why I’m sewing it), but I’m still mindful of how much I’m spending overall. So of course, when I decided that the lace I loved was the most expensive of my choices, I tried to talk myself out of it. This is where taking Andy shopping is actually quite helpful, as he thought I should buy the one I loved the most. What I chose, in the end, was this gorgeous Chantilly lace. I love the beading and the eyelash fringing. It feels fairly heavy (at least it does all folded up), but the drape and softness is amazing. Of course, I’m terrified of cutting into it, but I’m going to take my time and make sure that I’m 100% happy with my muslin before I do. I need to have more faith in myself! I’m making two veils. One for my hen party and one for the wedding. The hen party one was started yesterday and is almost finished. I’ll pop a photo up on Instagram when I’m done, I really love it! We also have an Instagram account for the wedding (which I really should use more). Until yesterday, I had no idea why it’s even traditional for brides to wear a veil. Apparently it goes back to the days of arranged marriages and stops the groom from backing out before the ceremony is over, just in case he finds his bride unattractive. Charming! Sames goes for the tradition of not seeing each other until the ceremony begins. You learn something new every day.